In some species, such as the Red-winged Blackbird and the Brown-headed Cowbird, male/female pairs partake in ‘duetting’ during pair formation. During a typical Brown-headed Cowbird duet, the male produces a high-pitched squeak and the female produces a lower-pitched, rattling trill. 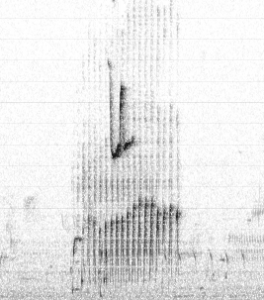 Below is a screen cap of a duetting pair (male sound at the top; female sound below). This duet can be heard at this time of year and though it’s not the most enchanting of the duets, it’s still pretty neat! Photo: Screen cap of spectrograph taken from Xeno Canto; XC160737. Elliot, L. 1999. Music of the Birds: A Celebration of Birdsong. Houghton Mifflin Harcourt., Boston, MA.